Visitors to Ukraine were well down in 2014 compared to the previous year. The country received 12.7 million foreign guests, a 48 percent decrease from 2013. The conflict in the east of Ukraine was undoubtedly the major factor responsible for the steep drop. Just over 2.3 million Russians visited Ukraine in 2014, significantly less than the 10.3 million that visited in 2013. In fact, during 2014 travellers from Moldova outnumbered Russians, despite a 19 percent fall in the number of Moldovan visitors. Visitors from most other countries declined. Fewer Poles, Romanians, Germans, Turks, Americans, and British contributed to the fall. The number of Hungarian visitors actually increased while the number of Slovakians visiting Ukraine fell by just 2 percent. The data in the graph and tables below comes from the State Statistics Service of Ukraine. Although we’ve no reason to doubt the total numbers, the split of visitors by purpose of visit looks a bit sketchy. Are we really expected to believe that throughout 2013 only 258 US citizens came on business and only 2 came to work in Ukraine? The number of foreigners visiting Ukraine fell from 24.7 million in 2013 to 12.7 million in 2014. 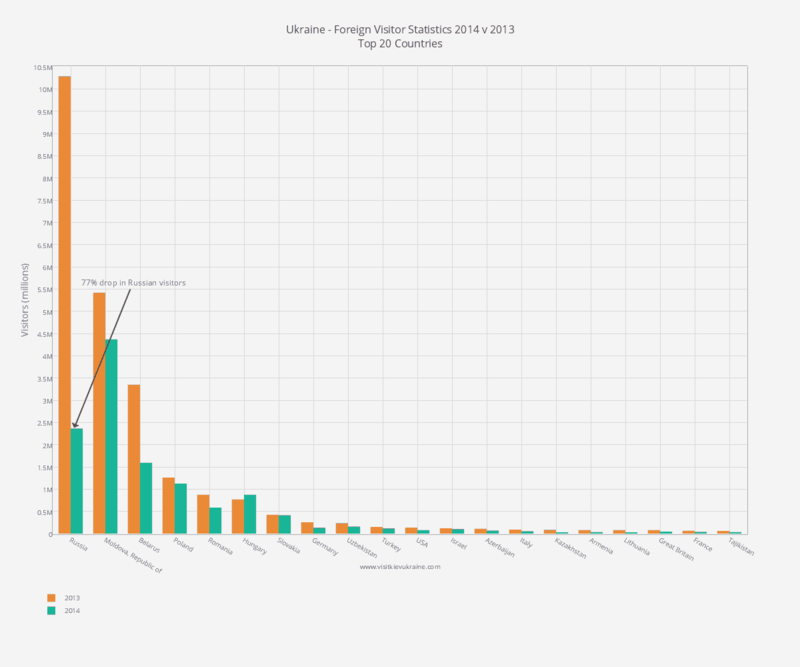 The number of foreigners visiting Ukraine in 2014 is shown in the table below. The data is split by country and purpose of visit. Please, could Saudi get visa from Airports in Ukraine? Or still need to obtain one form Ukraine Consulate in Saudi Arabia! ?